The Quaequam Blog: Don't like buying from Webshops? Worried about credit card fraud? Then Visit Forbidden Planet for your Small Press stars! Don't like buying from Webshops? Worried about credit card fraud? Then Visit Forbidden Planet for your Small Press stars! Yup, no mess, no fuss- FPI have taken stock of both the new ZARJAZ and the new DOGBREATH. When they will appear in shops in anyones guess- but the stock should arrive at the Maldon warehouse today or tomorrow, depending on Royal Mail. Can I state for the record that not for one minute did I ever think that a comic I drew for would be available in a 'proper' comic shop. Well done to all involved with the titles, and here's hoping that they come back and ask for more! This is great news - FP was like Lourdes to me as a kid, making my pilgrimages down to London (I bet I could even find some old paper bags, with that lovely Brian Bolland art), so I am chuffed to think something I wrote will turn up on the shelves. Also thanks to Tharg, he has been putting in a seriously good word for both publications and that has to have been a big help. It is certainly a fantastic feeling. I'm just waiting for someone to actually SEE a copy in the shop. Let me clarify- I'm waiting for someone to tell me that they saw a comic I drew the cover for in FP. Probably on the same shelf as the prog. That makes me feel warm inside. I do know at least one person that I mentioned it to who will be popping in to pick up a copy, when it appears. Perhaps drop them a line and they can let you know when they ship out so you can make an announcement. 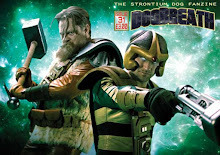 And/or have a word with the blog - they gave a nice mention and it might be in everyone's interests to do a little feature on Dogbreath and Zarjaz (explaining the history, etc.) as it could help sales all round. I notice their online shop has Zarjaz #1 and 2 from the previous management so I'd assume these would be listed there. Everyone wins. 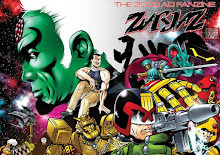 While on the thanking everyone front I should also throw in 2000 AD Review as I just noticed their new sidebar for Dogbreath/Zarjaz which is fantastic!! That's agood idea for the photo op! I like that. 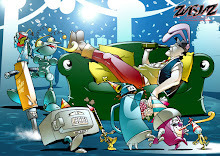 The 2000adreview link is nice isn't it. I was chuffed When Gavin offered that. The blog will be a good call, I'll mail Joe when I know they are there. Also if you are doing a round of publicity/striking while the iron is hot, then Regie Rigby gives British comics good coverage, and is one of the few (only?) 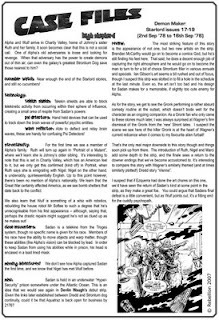 columns on the big comic news sites which gives coverage to British small press comics. Well, having singularly forgotten to buy some comics from you at Bristol, I was certainly hoping to see copies in the local FP in Leicester. They'd got Dogbreath in last week, but no sign as yet of Zarjaz, which seems a bit odd, as I'd assume they shipped across the chain together. Unless, of course, they'd already sold out of Zarjaz. The power of The VCs, maybe? Cheers Jay- I'd love to see a photo of the comics in one of the shops! If they have sold out- that is great!